It is not surprising to find evidence that the Ithihasa and Puranas are right. I have been posting articles validating the information provided by the Ithihasas and Puranas with the help of Astronomy,Archeology,Lingusitics and Geology. One more addition to the Geological evidence about the Mahabharata. It is a Rock shelter, presumed to be the oldest in the world. It is declared as a World Heritage Site by UNESCO. The Bhimbetka rock shelters are an archaeological site of the Paleolithic, exhibiting the earliest traces of human life on the Indian subcontinent, and thus the beginning of the South Asian Stone Age. It is located in the Raisen District in the Indian state of Madhya Pradesh, near Abdullaganj town and inside the Ratapani Wildlife Sanctuary. At least some of the shelters were inhabited by Homo erectus more than 100,000 years ago. 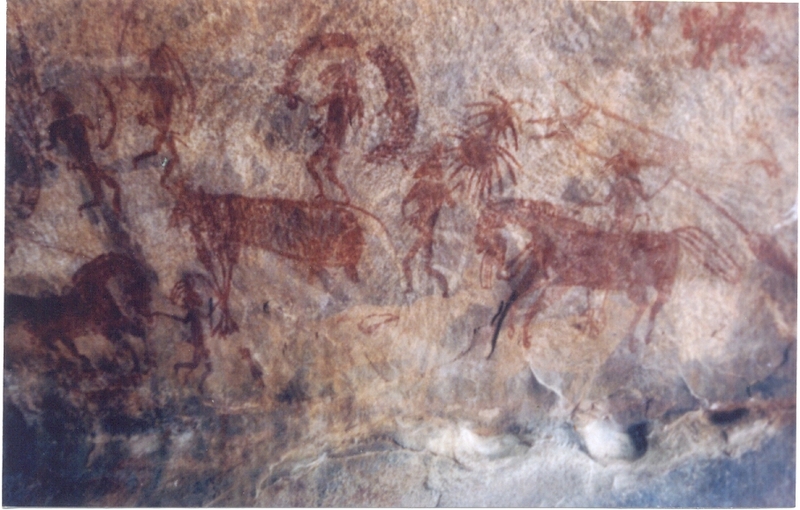 Some of the Stone Age rock paintings found among the Bhimbetka rock shelters are approximately 30,000 years old. The caves also deliver early evidence of dance. They were declared a World Heritage Site in 2003. Man Riding a Horse Bhibedka. The Rock Shelters of Bhimbetaka (or Bhim Baithaka) lie in the Raisen District of Madhya Pradesh, 45 kilometers south of Bhopal at the southern edge of the Vindhya hills. South of these rock shelters are successive ranges of the Satpura hills. Age: At least 290,000 years old petroglyphs, paintings up to 15,000 years old, newest drawings – 11th – 14th c. AD. hese caves contain the oldest known petroglyphs in the world, some of the most impressive galleries of ancient paintings and even the remnants of Buddhist temples and paintings from 11th – 14th century AD. There are hundreds of caves with paintings and some 12 – 15 are open for visitors. In spite of the unique values of Bhimbetka this site is not that popular among tourists yet. The largest Indian gallery of prehistoric art is spread over wide, circa 40 km² large area. Thus far here have been found some 760 caves on seven hills and more than 500 of these caves contain paintings and other artwork. The largest number of caves is on Bhimbetka Hill – 243 caves and Lakha Juar – 178 caves. In a wider area around Bhimbetka there are known more than 1,700 rock shelters. 2 kilometres south-east from Bhimbetka, 1 km east from Bhianpur there is another group of caves with ancient paintings – Chhoti Jamun Jhiri. Some caves are very small but others can be large enough to take hundreds of people. There is little doubt – exploration of these caves will provide exciting discoveries for many years to come. One such unexpected discovery was made in a large cave calledAuditorium Cave. Auditorium Cave is large, some 25 m long horizontal cave. At the far end of entrance gallery it widens into larger room with three passageways diverting from it. In the centre of this hall there stands enormous boulder – “Chiefs Rock”, 2.5 m high and 3.4 m wide, its volume is approx. 9 m3. Cave was well known but it hid an unexpected surprise. In 1990 here, on Chief’s Rock, were discovered 9 cupules – simple, round hemispheric cavities with traces of red pigment. They looked very old but it seemed nearly impossible to find their true age.